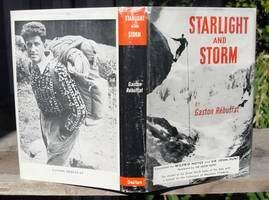 This is the 1967 original first printing of the first USA edition of STARLIGHT AND STORM by Gaston Rebuffat. It was published in New York by E. P. Dutton in 1957. The book measures 219mm tall x 141mm, and has 189 pages, 48 b/w photos, 1 map, 6 diagrams, glossary, index. Rébuffat’s first book to be translated into an english edition. His account of his climbs of Grandes Jorasses, Piz Badile, Drus, Matterhorn, Cima Grande di Lavaredo, Eiger (with Magnone, Buhl, Jochler, Otto & Sepp Maag). 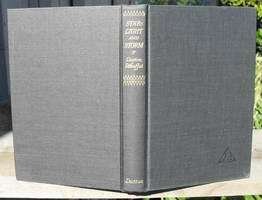 This first USA edition has more photos & an extra 50 page technique section, not found in other editions. CONDITION: Original black cloth, spine lettered in gilt. Original dust jacket (light soiling rear panel, rubbing tips corners, two 4mm clean tears). The book is in nice condition with former owner personal bookplate on blank FFEP, no other previous owner marks or writing on any pages, tight binding, no foxing, clean pages. Price: $95.